When you do freelance work like I do, you take your gigs where you can get them. You might find yourself one week writing web copy for a drone company, another exploring the ins and outs of electricity for a science centre exhibit panel. Some of the work is fun and interesting. Other times it’s educational or even eye-opening. Many gigs are routine and a few are downright boring. Only rarely…very rarely…is the work meaningful in the largest sense of the word. On that note, welcome to Illusuak. 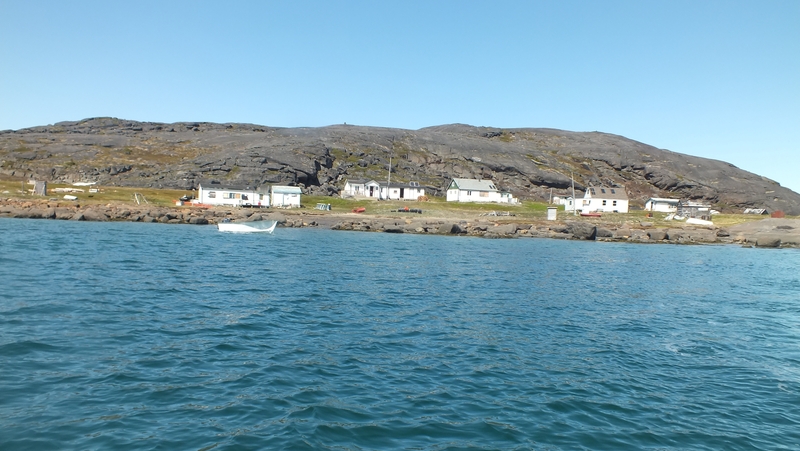 Illusuak is an Inuktitut word for “sod house,” the traditional summer home of Labrador Inuit. 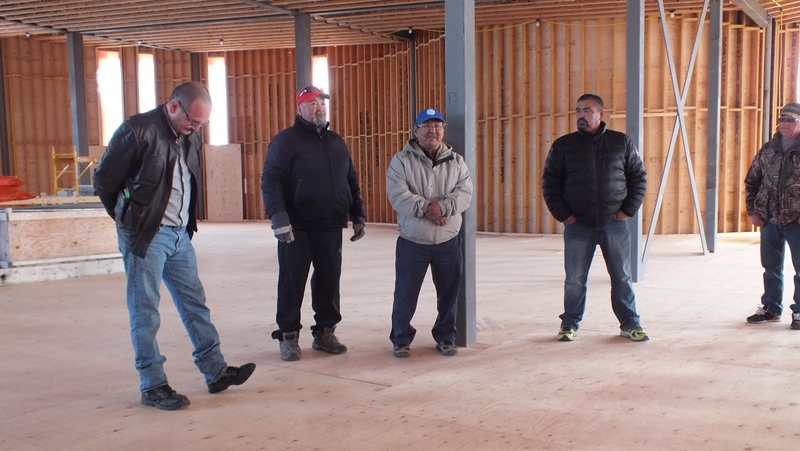 In this case however, Illusuak is a Labrador Inuit cultural centre, currently under construction in Nain, Nunatsiavut. The centre will include a cafe’, theatre, gift shop, and Torngat Mountains National Park visitor services. But most importantly, it will feature a cultural exhibit hall. And that’s where I come in. I am honored and extraordinarily humbled to be part of the Blue Rhino Design team, selected to develop the Illusuak cultural exhibit. Hands and hearts will come together to make Illusuak a reality. 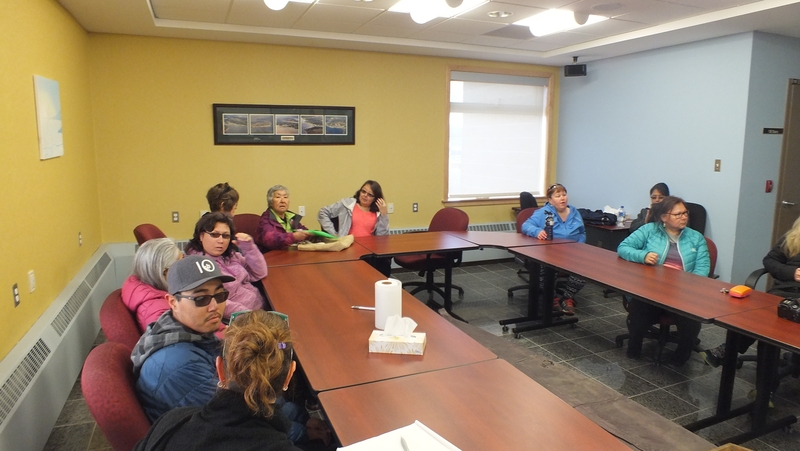 Pictured here are members of the Illusuak Exhibit Advisory Committee, the Blue Rhino Design team, the cafe’ consultants, representatives from the Nunatsiavut government and Parks Canada, and local residents and community leaders. 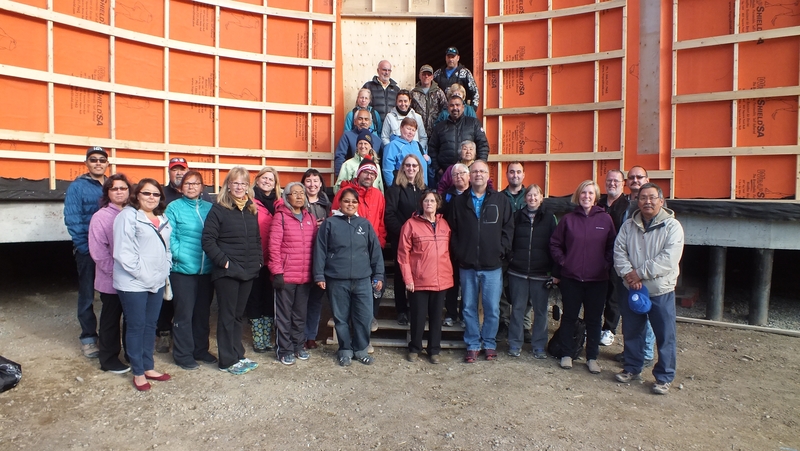 Last week, I, along with the rest of the Blue Rhino Design team, traveled to Nain to kick off the project and get a taste of the local culture. And somewhere between our plane taking off from Toronto Sunday and .. I don’t know .. Wednesday morning .. everything changed. It went from being an exciting new gig to something powerful and meaningful. It wasn’t the stunning scenery that did it — though the endless miles of rock and water and ice, all untrammeled by urban expansion, roadways, and exploitation was awe-inspiring. Nunatsiavut is the self-governed Inuit region of northeastern Labrador. The town of Nain is the northernmost year-round inhabited community in Labrador. 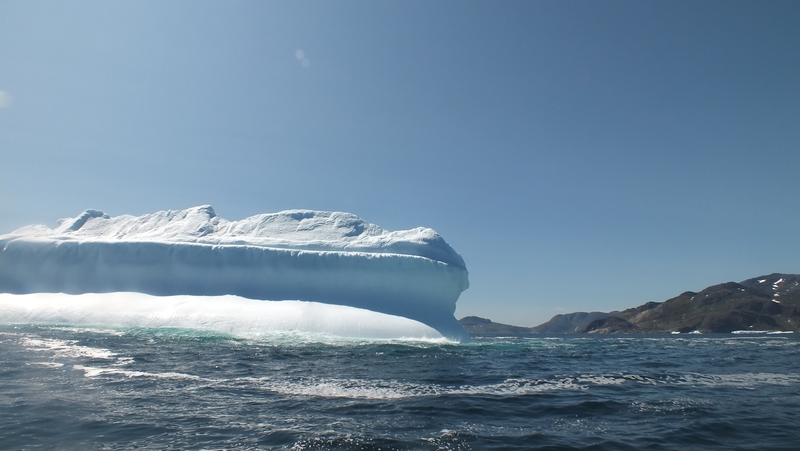 It wasn’t “going off” on the boat, where our hosts shuttled us for hours among stone islands, icebergs, and glacial waterfalls and then right out to the rolling Labrador sea. 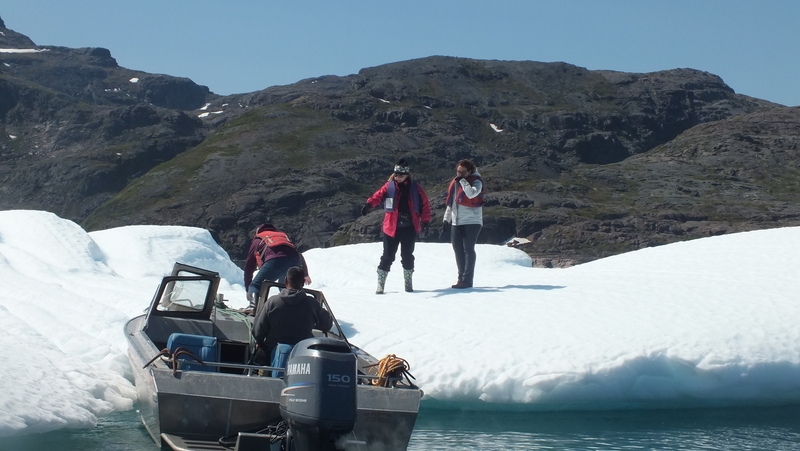 It wasn’t even the part where we drank the glacier water or planted our feet on an iceberg. Nor was it the “boil up” — a simple pot of tea brewed from iceberg water over a small fire, accompanied by crackers and the most delicate and succulent wood-smoked arctic char. 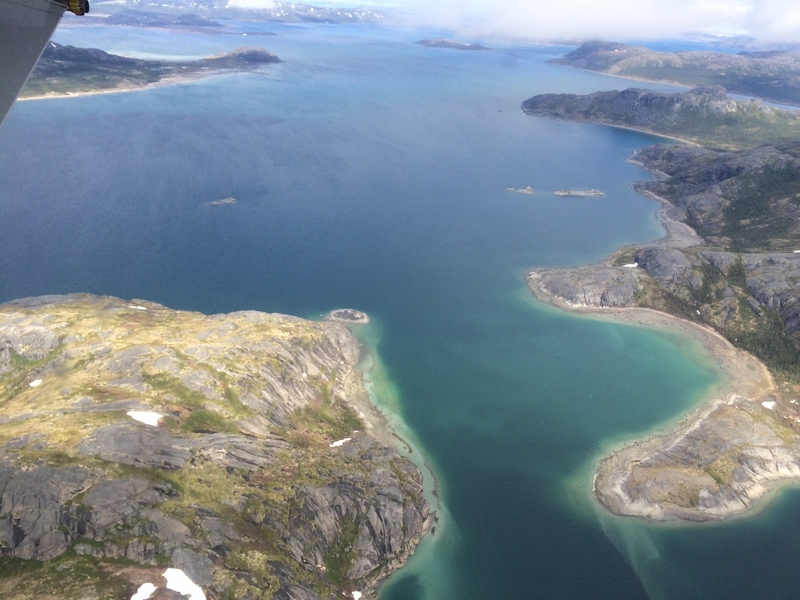 It wasn’t the chance of seeing the subarctic wildlife — moose, caribou, seals, minke whales, beluga, orcas, black bears, polar bears, and northern waterfowl. 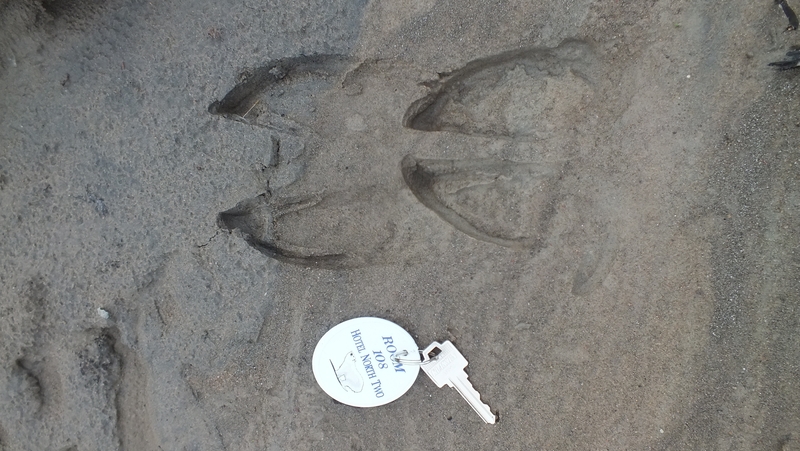 Moose prints on a sandy beach outside of Goose Bay. 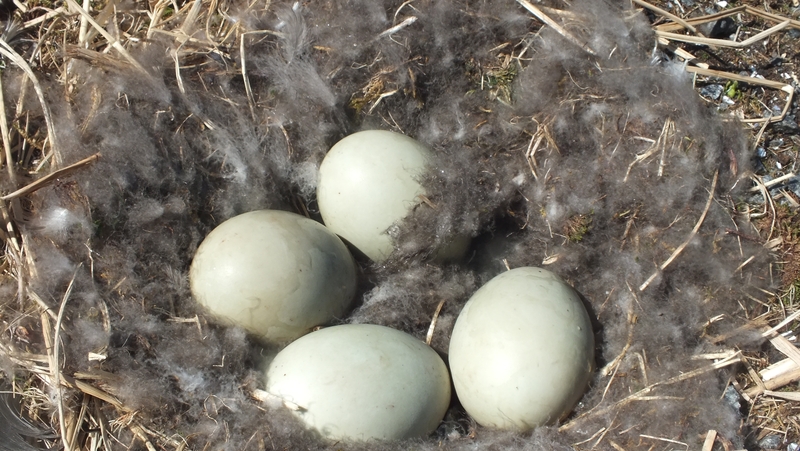 Eider duck eggs, an important springtime staple for Labrador Inuit. 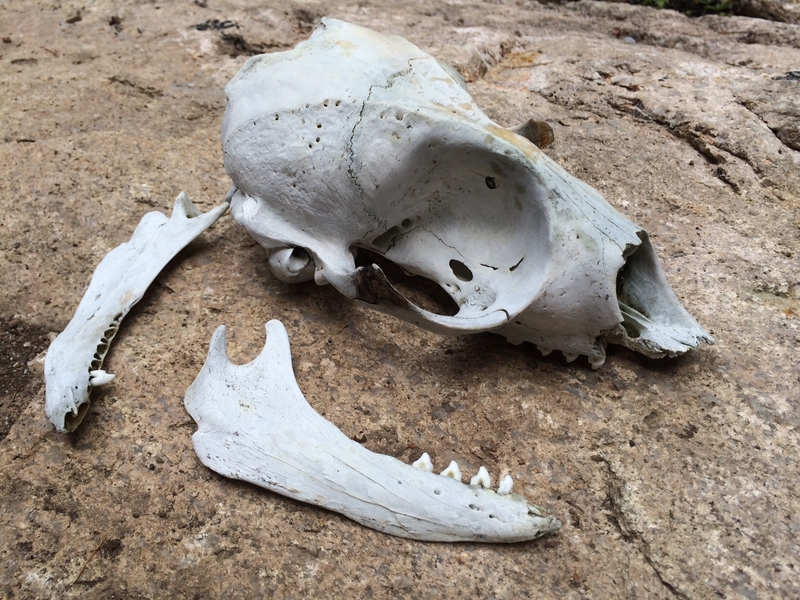 Nor was it my find of a beautifully bleached and preserved seal skull on a rugged beach and the generosity of our Inuit friends to allow me to take it home. What changed me — changed us — was the depth of passion among the people of Nain and the surrounding communities for Illusuak. It was our realization that this was more than just a museum or visitor centre, but that it would be core to these people’s legacy– finally a true and unsanitized representation of their lives and culture — past, present and future. Cabins replace sod houses, but still many Inuit spend their summers “on the land” in small communities like this one or in solitary dwellings. This was a thriving cod fishery before the cod population collapsed. Now they catch Arctic char. It was when a representative of Nain choked on his words while making his introductory speech to us inside the unfinished building. It was when one of the advisory committee broke down while describing his mother’s home that had stood on the spot where we were now meeting. It was an older man, quietly telling us the story of his recovery from “many bad things” that had happened to him and how today he is filled with nothing but love. 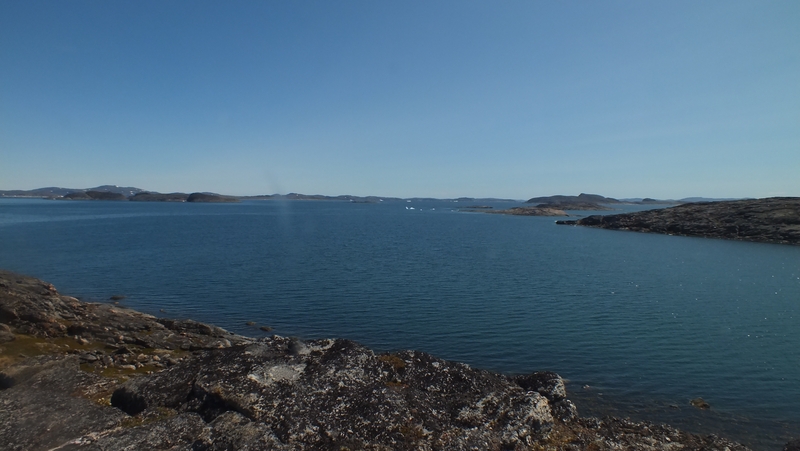 It was learning that in one dark year, seven of Nain’s young people committed suicide and five elders died. The Nain Moravian Church, built by Moravian missionaries in 1771. Inuit have been on the receiving end of colonial oppression and racism for generations. They have struggled to maintain their culture in the face of white privilege and demands. They have lost generations of cultural knowledge to residential schools, forced relocation, and assimilation. Their history has been ignored, glossed over, or cleansed in the accounts contained in most museums, text books, and government publications. 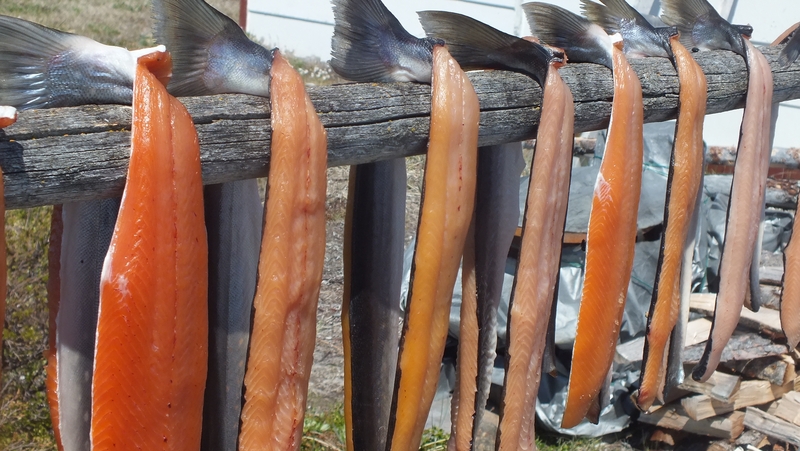 Arctic char drying in preparation for smoking. So Illusuak is for them. When I asked how much of the exhibit area should be devoted to answering fundamental questions a visitor might have — What language do you speak? Do you prefer the term aboriginal or native? How do you hunt seal? — the answer was “none.” Illusuak is not about educating outsiders. It is about Inuit telling their own stories, confronting their past and educating their young. In telling the Labrador Inuit story, we will use their voices and language to address truths, some of which have seldom been spoken. Many stories will be hard to deliver and even harder to receive. There will be spaces allowed for reflection and healing. There will be the images of ancestors, the wisdom of elders and the voices of youth. And finally, there will be messages of hope for the young people and sense of pride in what it means to be Inuit. I was so looking forward to this post. As usual, you do not disappoint. You bring light and clarity to the work of writers and more importantly, the people who call this place home. Wow that is so amazing very happy for you Kimberly! Admittedly, slightly jealous too. Looking forward to the updates about your work there. Thanks John. I noticed I saw no reptiles there and there was no mention of catching any. Wonder if snakes or turtles can live that far north. Will have to research that. Oh, Kim. They picked the perfect team to honour their culture, their hearts and their souls. Lucky, lucky you. What a gift to work on a such a significant project. Thanks for sharing your experiences. Keep us posted, please! Thank you Heather. Yes, it really is a gift. Will certainly post updates here. I BEEN TO NAIN! & to every settlement south of Nain on the Labrador Coast! Aboard The Northern Ranger freighter/ferry, boarded in Saint Anthony Newfoundland! Forced to kiss a salt cod! Was intoxicated by the world’s most intense Aurora! Wow now I wanna go again and see the cultural center. 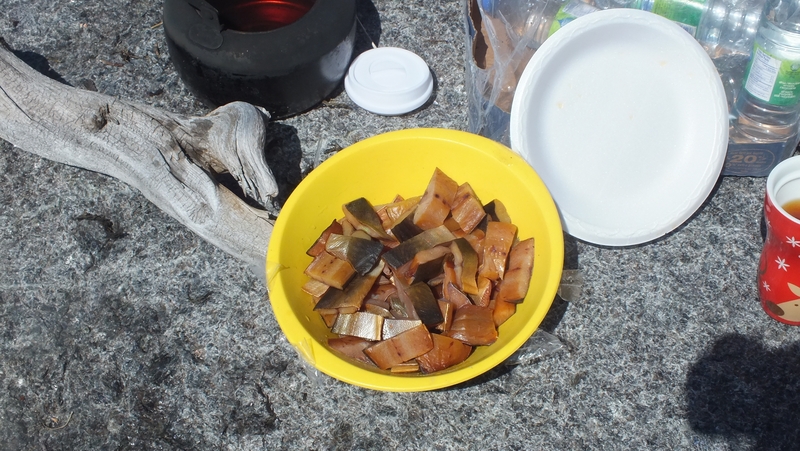 And eat smoked Arctic char and caribou again! I hope you were 1/100th as thrilled as I was! Bob, that’s an amazing coincidence — finding that one of my regular readers has been to Nain, of all places. The Northern Ranger came into Nain while we were there. Much excitement in town. I neither kissed a cod nor witnessed an aurora. Will pass on the first and hope to experience the second when we go back in October. Meanwhile, the centre is slated to open in Fall of 2017, so book your ticket! Wow. What an awesome blog. You managed to convey so much beauty and wonder and spirituality. This sounds like such an amazing and meaningful project. Congratulations! A wonderful painting I recently purchased took me on a journey to your post, Nain and the beautiful Illusuak Centre. The painting by artist Sheilagh Harvey is a wonderful depiction of northern Labrador landscape. 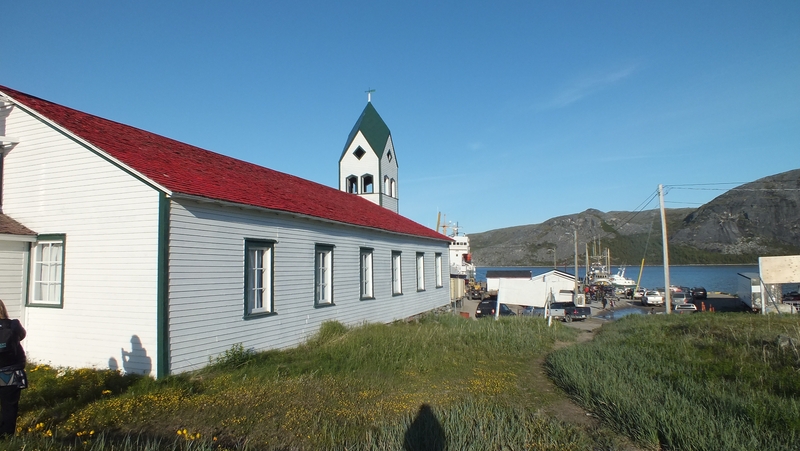 Upon searching for information on the artist I found a gallery in Nova Scotia that features her prints and I discovered the story of Nain and the building of this beautiful centre. I wish the people of Nain all the best and so hope that a way can be found for the northern people to be able to visit this place and feel the pride that their story is being depicted in such a wonderful, real manner. Their story, their way. Beautiful. Thank you for your comments reasonrhymes. I looked up Sheilagh Harvey. She does lovely work. I like her aurora paintings. Thank you for stopping by and sharing your story.